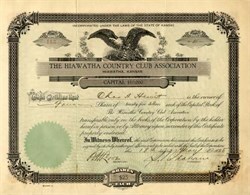 Beautifully engraved certificate from the Hiawatha Country Club Association issued in the 1920's. This historic document has an ornate border around it with a vignette of an eagle with a shield and arrows. This item is hand signed by the Company's President and Secretary and is 79 years old. Hiawatha was founded in 1857. John M. Coe, John P. Wheller, and Thomas J. Drummond were instrumental in organizing the town, and the site was staked out February 17, 1857. B.L. Rider reportedly was responsible for naming Hiawatha, taking the young Indian's name from Henry W. Longfellow's poem, "Song of Hiawatha." The main street was designated Oregon Street after the Oregon Trail. Parallel streets north of it were named after Indian tribes north of the Trail, and streets south carried tribal names of those south of the Trail. Hiawatha became the Brown County Seat in 1858, and the first school opened in 1870.